September 20, 2016. 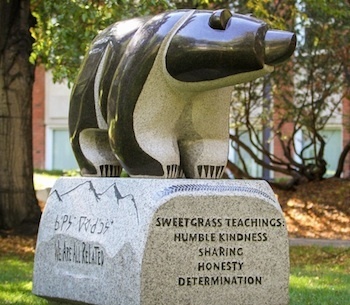 The Treaty Bear, the new granite sculpture by Stewart Steinhauer that was recently unveiled on the University of Alberta campus, will be part of a discussion led by Faculty of Extension academic instructor Janice Makokis at noon hour on Wednesday. She will also share knowledge about Indigenous natural laws, governance, and leadership that have existed for generations. Makokis’ talk is part of UAlberta’s Students’ Union GovWeek. The session will take place from 12 noon to 1 p.m. at main floor atrium of UAlberta's Faculty of Extension in downtown Edmonton.